Three of the East Caribbean states that offer Citizenship by Investment (CBI) programs to foreign nationals, after seeing that the Due Diligence investigations performed upon their applicants was ineffective, have taken initial steps to upgrade them to Enhanced Due Diligence. This step will result in eliminating high-risk and unsuitable applicants, prior to the processing of their CBI applications. The jurisdictions that have recently taken action to incorporate EDD into their programs are Antigua and Barbuda, and Grenada. 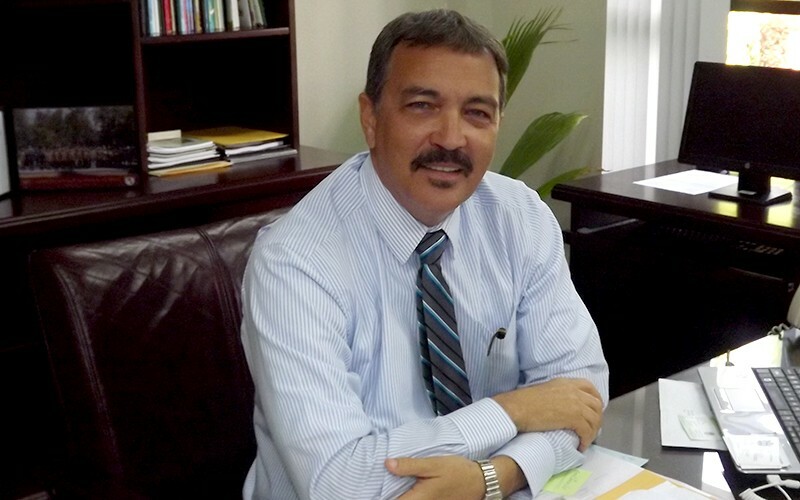 Officials in St Kitts & Nevis have also made inquiries designed to acquire EDD capability for their CBI program, and while they are not as far along as the other states named above, it appears that they also intend to have an Enhanced Due Diligence level investigative procedure replace the ordinary due diligence which resulted in approvals of high-risk & unsuitable applicants in the past. We are hopeful that St Lucia, which operates a relatively new program, sees the benefits that program upgrading will bring to its effectiveness. Unfortunately, the Commonwealth of Dominica, some of whose CBI passport holders have been arrested for criminal conduct, and international sanctions evasion involving Iran, Syria and North Korea, has not chosen to reform its CBI programs, and this policy failure could result in it receiving a greatly diminished market share of CBI industry applications in the short term. The upgrading of CBI programs to EDD should also lower the Country Risk ratings of those Caribbean countries that participate, and it is also believed that there will be strengthening of their correspondent relationhips with North American banks, due to increased confidence in the legitimacy of CBI program passport holders. The benefits of adopting EDD in CBI programs positively affect these other issues, and their role as an unexpected benefit should be recognized. 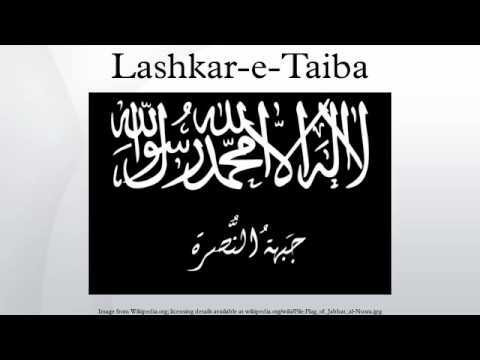 Mohammad Ehsan a/k/a Mihammad Ahsan, who obtained a Grenada passport, is the Financial Secretary for MML, the political wing of Lashkar-e-Tayyiba (LeT). Both Ehsan and LeT are OFAC-Designated SDGT. He is a terrorist financier, yet he was able to obtain a Grenada passport, after he married a local girl. His passport has been revoked, and his deportation ordered by a judge, after a hearing was held in grenada. The fact that Ehsan, althrough a known LeT associate, was granted a passport after marriage, indicates that there most likely was no due diligence performed upon him, as even the most rudimentary investigation would have found that he was unsuitable for Grenadian citizenship. Our EDD investigation also shows that he has two prior arrests for narcotics trafficking. It should be self-evident that Enhanced Due Diligence must be performed upon all foreign candidates for citizenship, no matter how it is being obtained, for the East Caribbean states have been targeted for passport acquisition by Middle Eastern terrorist organizations, with special attention to Hamas and the Palestinian Islamic Jihad. There has been much said of late, and much finger-pointing, made by Caribbean leaders who are unhappy that a large number of American financial institutions have terminated correspondent relationships with Caribbean banks. It is now time for some blunt observations, from one who can objectively frame the isues, and offer meaningful solutions. It is not intended to offend, but to educate, all the interested parties to what is a serious problem. 1. Contrary to public opinion, there is no absolute right of foreign banks to have access to the US financial structure; given America's current law enforcement and regulatory situation, US banks must, in operating their risk-based compliance programs, minimize the possibility that money launderers, financial criminals, and terrorist financiers, will be able to gain entry, through correspondent accounts. 2. Bankers, and compliance officers, now properly fear personal threats to themselves, due to perceived negligence or compliance malpractice. American bankers are now facing potential fines, exclusion from financial institution positions, and even criminal charges, for what regulators or law enforcement deem to be failures. Why should a US banker expose himself or herself, due to deficiencies of banks abroad ? 3. Candidly, Anti-Money Laundering (AML) and Countering the Threat of Terrorist Financing (CTF) programs at most Caribbean banks are not at the level of Banking Best Practices which we see in the United States. This is due to lack of sufficient funding for compliance, use of staff whose training & experience, and authority, is minimal, and insufficient technological resources to successfully complete the tasks at hand each day. 4. Failure of Caribbean banks to create, and operate KYCC, or Know Your Customer's Customer, programs, which allow US banks to actually look into the Caribbean bank's clients' accounts. Unless a bank in New York can rule out a deposit as a possible money laundering event, the US bank will remain in the dark, and feel insecure about the transaction. Loss of correspondent relationships begin from such events as this one. This is software that gives onshore banks a window into foreign bank customers, but most Caribbean banks will not use it. They are ignoring the solution at their perill. 5. The negative influence of suspect funds, coming into local Caribbean banks, in connection with the Citizenship by Investment (CBI) programs, being operated by five East Caribbean states, just adds more fuel to the fire. 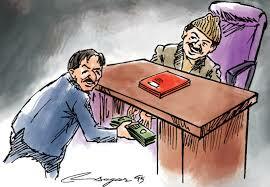 The presence of potentially dirty money, in laege amounts, is enought to destroy any ocrrespondent relationship. As you can see from paragaph four, there are effective solutions to virtually all these critical issues, many of which we owe to technological advances made during the past deade. In future articles, we will analyze each of them, as a practical way out of the current correspondent banking emergency being experienced by Caribbean banks; stay tuned. Today, a judge in Grenada ordered that Muhammad Ehsan, a Pakistani national whose Grenada passport was revoked by the government, be deported forthwith. It is expected that he will be quietly removed this weekend, without publicity. Counsel for Ehsan had temporarily blocked his deportation earlier this week, by filing written objections, and requesting a hearing, but the Court considered ther matter, agreed with the government position, that he was an undesireable alien, and ordered his deportation. 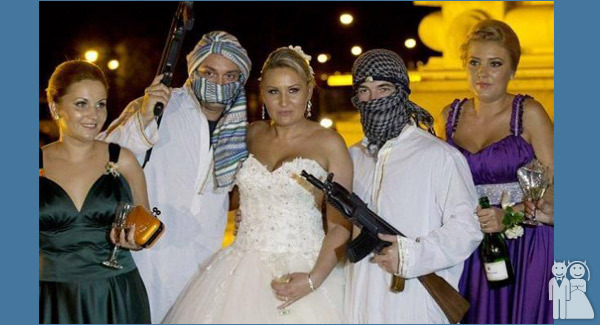 Ehsan, who obtained Grenadian citizenship through marriage, is a known associate of a sanctioned terrorist organization. It is believed that the group's scheme is to obtain passports from East Caribbean states, under aliases, and obtain visas to enter the US & Canada, with those "clean" identities and EC passports, to commit terrorist acts. 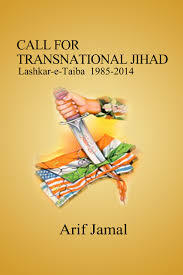 This case comes at a time when many in the East Caribbean states have expresssed alarm about posible Middle Eastern terrorists purchasing CBI passports, as part of their expanding global operations planned against civilian targets. Considering that the United States is known to be one of the primary targets of these groups, denying them CBI passports is a priority that all of the jurisdictions in the regions should recognize, using Enhanced Due Diligence to weed out their agents, associates and members. 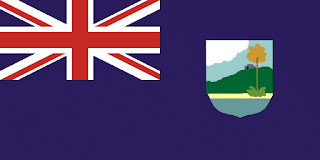 The recent disclosures, on global media, that organized crime syndicates in the Ukraine are using British Virgin Islands (BVI) companies to purchase high-end London real estate should serve as yet another reminder of how the BVI has become the favorite resource for opaque corporate formation; it is regularly used by organized crime, tax evaders, corrupt Politically Exposed Persons (PEPs), international sanctions evaders, and all the other usual financial crime suspects. 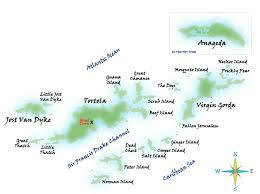 Remember that the Panama Papers showed that Mossack & Fonseca chose the BVI over all the other offshore jurisdictions, for corporate formation; this was borne out by the fact that the majority of M & F companies were from the BVI. 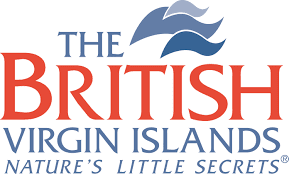 You will never get accurate, verified official information on the Beneficial Owners of BVI corporations; many investigative journalists who have chosen to ask the tough questions there, in person, have found themselves on the next available aircraft out of the territory, that is assuming they were even able to get out of the airport after arriving there. 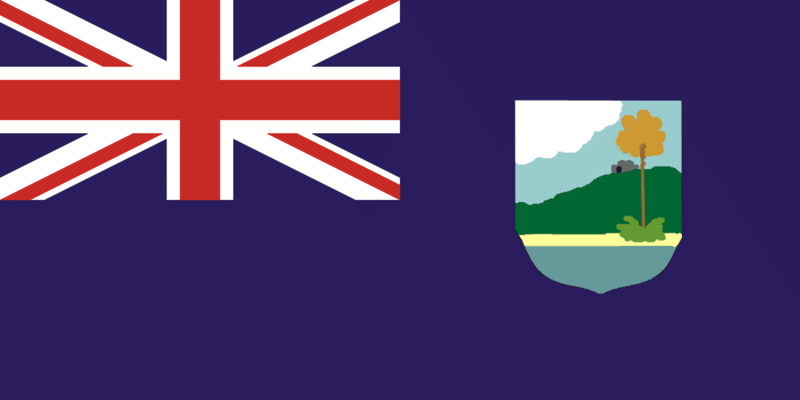 Local autonomy trumps any complaints from the United Kingdom, for corporate formation keeps the BVI government, and yes, its economy, afloat. When compliance officers encounter a BVI company in account opening, real estate transactions, securities certificates, they should ask themselves why did the owner of these assets entitle them in this manner, and can they conclusively prove Beneficial Ownership ? If not, there is potential expoasure to such nightnares as OFAC-sanctioned individuals or entities, career criminals, and other unsuitable elements. Try not to be included in a future 200-person federal criminal conspiracy charge, because you failed to obtain answers to the tough questions, because US law enforcement agencies wake up and take notice when they see that a British Virgin Islands corporation was used yo take title to an asset. 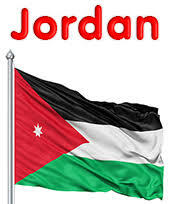 Media reports from the Middle East tell us that the Hashemite Kingdom of Jordan is in the process of cancelling a large number of Jordanian passports, which were issued, as a "courtesy," to most of the Palestinian Authority leaders. The reports state that thirty of the top leaders, including the PA president, and his senior ministers and advisers and their extended families, as well as others who may be members of OFAC-designated terrorist organizations. These actions leave those prominent Palestinians without passports, as the PA, not being a sovereign nation, can only issue rudimentary travel & identity documents, which are not acceptable in a number of countries. Therefore, you can expect that their advisers will be seeking alternative passports. If you recember two of our recent articles, some East Caribbean states have begun direct marketing CBI programs to Palestinians. Our fear is that, in their rush to accept a new group of affluent applicants, the five CBI judisdictions, St Kitts & Nevis, Antigua & Barbuda, Dominica, St Lucia & Grenada, may pass one or more individuals who are terrorist agents seeking to gain new identities, and receive clean passports from a Commonwealth of Nations jurisdiction, which insures global travel that is virtually visa-free. 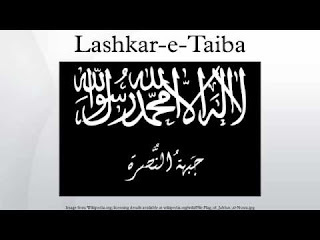 Thus, the five CBI republics would do well to carefully examine all applications from the Middle East, or from a country where Palestinians currently reside, and cull out all that a proper Enhanced Due Diligence investigation determines are either terrorist agents, terrorist financiers, or those whom the evidence suggests are reasonably suspected of providing material support to terrorist organizations. A Pakistani national, with ties to a known terrorist organization, has been detained by the authorities in Grenada, which are seeking to deport him. Currently under investigation by the United States, the individual, who has been identified as Muhammad Ehsan, reportedly was engaged in a sophisticated operation designed to allow terrorists access to the United States and Canada. His citizenship was reportedly revoked. The scheme involved securing local East Caribbean girls to marry terrorist agents from the Middle East, thereafter obtaining Grenadian citizenship. Ehsan married a local for this purpose. It is believed that a substantial payment may have been involved. Citizens of Grenada notably have visa-free travel privileges to the United States, pursuant to a special arrangement that is not available elsewhere in the East Caribbean States. These new "Grenadians" could then enter the United States without being interviewed in advance, as they are not required to obtain US visas. Should they also choose to travel with their "wives" into North America, the resulting profile would present as exrteremely low risk to immigration and customs officials, meaning that a successful entry would be highly likely. The "wives" would get a free trip out of it, and most likely be totally unaware that they had entered into a lucrative arranged marriage with terrorists. A variation on the scheme was in operation in Canada several years ago, when Russian females sought out single Canadian males, who they paid $10,000 to, and arranged a sham marriage, in order to obtain Canadian residency, and ultimately citizenship. We trust that the authorities in Grenada will effectively shut down this illicit scheme, as it poses a direct national security threat to the US and Canada; terrorist infiltration represents a clear and present danger. The incestuous relationship between CBI consultancies, and the officials who head the Citizenship by investment Units in the five East Caribbean States, which include the payment of substantial bribes and kickbacks, can result in dangerous and unsuitable CBI applicants being accepted. These illegal payments, which result in dependent relationships, on the part of the CBI unit officials, force these government leaders to do the bidding of the international, but completely unregulated, CBI consultancy industry, whose leverage, maintained through continual "financial support," causes it to dominate the government officials that are relied upon to be perform their duties without any Conflict of Interest. One recent case will illustrate how these illicit payments have become a regular component of one CBI official's life. This individual has the UK private school tuition of a child fully paid for by the CBI consultancy; a major investment in a paramour's restaurant was made, and the amount came from an "external source", not the official's assets or income. There is an unsubstantiated rumour about, to the effect that the total sum of funds paid out by the consultancy exceeded $1m. The problem is, the CBI unit officials get used to this extra "income." and do not want to have to return to their previous situation, where they did not have the financial means to enjoy the finer things in life. To prevent that from happening, they give in when the CBI cosultancy makes a request that causes them to break the law, or take unnecessary risks regarding the CBI program that they are responsible for supervising. No wonder there are so many unsuitable CBI applicants that end up obtaining the prized passports. The fugitive from American justice Leroy King, former Antigua financial services regulator, and co-conspirator in R Allen Stanford's billion dollar Ponzi scheme, was allegedly offered a sweet plea deal, to cooperate against several prominent Antigua recipients of Stanford's bribes and kickbacks, according to sources close to King. The former regulator faces a potential life sentence, to be served in an American prison, for his role in fending off US regulators and investigators, thereby allowing Stanford to extend his Ponzi scheme for years. Extradition proceedings have been delayed, for years, due to local political interference with the judicial process. King was reportedly ofered a very short US prison sentence, only 24 months of incarceration, in exchange for his cooperation, but his advisers convinced him to decline the offer. He was originally promised protection from extradition, wealth and status, but he presently lives in a tiny, primitive residence, and has not seen any of the promised wealth and prestige he expected to receive. King is expected to follow the orders of his advisers; he recently was required to disburse cash to Antigua voters, in the National Election, so that they would return the ruling party to office, as part of a widespread campaign of voter fraud. 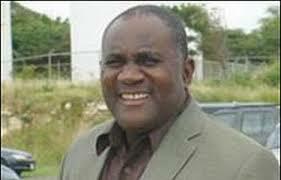 There are unconfirmed rumors that he will be extracted from Antigua, by other than judicial means. Should that occur, his failure to accept the plea offer will be moot, and he will face a jury trial in a state where there are many vocal Stanford victims. King remains the sole fugitive remaining in the Stanford criminal case. 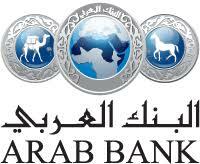 The United States Supreme Court today ruled against the plaintiffs, who brought suit against Arab Bank PLC. a foreign corporation, pursuant to the Alien Tort Statute, for payments made by the bank to the families of convicted or deceased Palestinian terrorists. The high court, in affirming a Second Circuit ruling, which dismissed plaintiffs' ATS claims, cited from a Supreme Court case that held where all the relevant conduct took place outside the United States, dismissal was required, based upon the presumption against extraterritorial application of statutes. Readers who wish to review the complete text of the 91-page decision; the style is Jesner vs. Arab Bank, PLC. You may acess it here. The District of Columbia Circuit Court of Appeals has affirmed the District Court decision entered against the Waked Money Laundering Organization, which had brought an action against OFAC, challenging an SDGT designation. The Waked plaintiffs alleged that the US Government denied them Due Process when they sought information on OFAC's naming of the plaintiffs and others as Kingpins (Specially Designated Narcotics Traffickers (SDGT), and for violating the Administrative Procedure Act (APA), which regulates govertnment agencies' actions. In a 23-page Memorandum Opinion, with citations to all the relevant case law, the Court "concludes that Defendants have provided Plaintiffs with sufficient post-designation notice, under both the Due Process Clause of the Fifth Amendment and the APA". The Court did not reach a decision on whether non-citizens are entitled to constitutional protection, because it held that there was adaquate notice and opportunity to be heard. It ruled that OFACs post-designation disclosures (a three-page summary) satisfied Due Process, and that OFAC followed its own regulations and procedures. Readers who require a review of the complete text of the opinion may access it here , in pdf format. 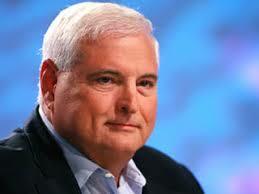 The Eleventh Circuit Court of Appeals has set Oral Argument in fugitive ex-president Ricardo Martinelli's appeal of an adverse ruling in his extradition case. The Court set it for the week of July, 16, 2018. Please note that the court file remains sealed, for unknown reasons, though we have given our readers the benefit of the underlying facts in prior articles, (obtained by reliable Panamanian sources), explaining why the file has been sealed, in an unconventional manner. To obtain access to the information, kindly access those articles for details. 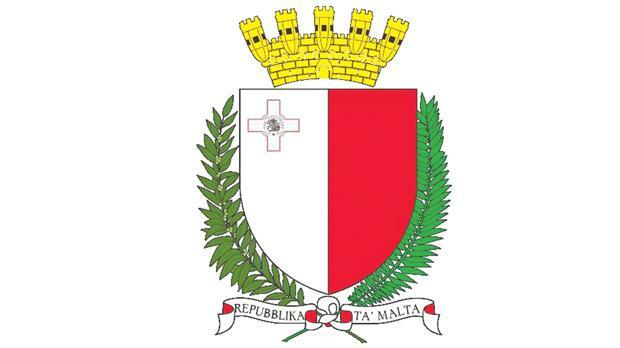 WILL REGIONAL ASSOCIATIONS IN THE CARIBBEAN FOLLOW EU LEAD ON MALTA'S CORRUPTION ? If you follow the news of the European Union's issues with Citizenship by Investment programs of its members, you know that EU Minister of Justice Vera Jourova has scheduled a visit to Malta, to discuss, primarily,what have been referred to as "money laundering issues." 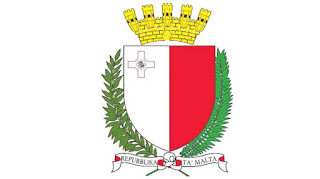 Malta faces a sanctions procedure, due to its unexplained delay in adopting new EU rules on money laundering. The EC Vice President, Frans Timmermans, speaking on the matter, stated that CIP passports may only be issued to individuals who have a "demonstrable link" to an EC country. This principle should apply to all CIP programs, including those outside the European Union. Additionally, unresolved issues there concerning the CIP program, illicit payments allegedly made to government officials in connection with its operation, and their appearance in the Panama Papers, all are being ignored by government, leading to the presumption that money laundering arising out of illegal payments by CIP consultancies, has occurred, and is being artfully covered up. Taking the EU actions as guidelines, whistleblowers* concerned about the rampant corruption, mismanagement and negligence, surrounding the CIP programs in certain East Caribbean jurisdictions**, are quietly taking action by seeking the active involvement, and investigative action, by Caribbean regional associations, groups, and organizations, of which Antigua & Barbuda, Dominica, and St Kitts & Nevis are members. Those agencies include, but are not limited to, CFATF, CARICOM, The East Caribbean Central Bank, and the OECS. * including one individual who was formerly the principal adviser to the president of an EU agency. **The United Kingdom recently announced that it would be posting High Commissioners to certain East Caribbean States, including Antigua. The disclosure that a prominent Fox News commentator, a close friend and adviser of the President of the United States, Donald Trump, employed shell companies to hide his ownership of millions of dollars of real estate investments, including one major project where the loan to purchase it was insured by HUD, again reminds is that beneficial ownership laws, regarding corporate ownership, are still not the law in America. Every time a proposed bill to require total and complete transparency, regarding who owns a corporation, it never makes it into law. Don't you wonder why the Republican-controlled Congress allows that to occur ? Some types of investors want to operate in the dark. If America does not adopt an effective law on corporate transparency, we will continue to see foreign criminal elements, corrupt Politically Exposed Persons (PEPs) from abroad, frontmen for organized crime, and various and sundry other groups wth dirty money to invest, buying a part of this country. Unless bank compliance officers, lending oficers, and law enforcement agencies, know who owns a corporation that owns investment property, the abuses will continue. 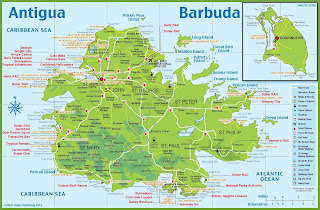 Recent developments in Antigua, when analyzed for the purposes of calculating Country Risk for compliance officers based in North America, have all combined to create a Perfect Storm of corruption, and which makes any financial investment, access to the country's courts, or substantial financial transactions with its financial institutions, extremely high risk, for both foreign investors, as well as global banks. The risk of loss is simply too great at this time. 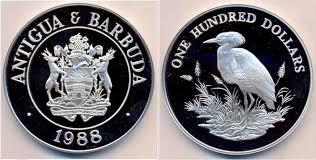 Back to back scandals, where major foreign investors were defrauded and cheated out of millions, a scandal involving the interrogation of a sitting Antiguan minister by British police, investigating bribes extorted from a British investor, and the unexplained disappearance of large portion of CBI revenue, prior to its arrival in the treasury, are additional evidence that risk levels are off the charts. conduct an investigation of the 200 passports case, which involves police corruption, until SVG police broke the case open, all add up to a jurisdiction which should be given a very wide berth by prudent foreign investors. 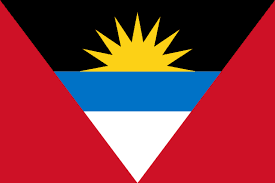 It is strongly suggested that compliance officers charged with assessing Country Risk examine the issues presented above, and raise Country Risk on Antigua to the highest level, and maintain it there, until the country institutes a major reform of both its CBI program, and its conduct to foreign investors. NOTE TO READERS: We have previously discussed Country Risk issues with Antigua in compliance-related articles published in 20111 and 2014. They are available on this Blog. 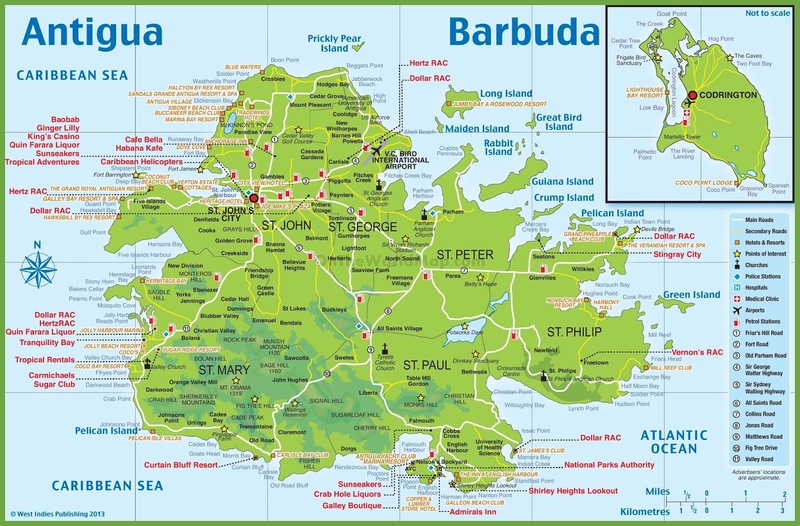 IS PLACEMENT OF BRITISH HIGH COMMISSIONERS IN ANTIGUA AND GRENADA INTENDED TO REIN IN WAYWARD EAST CARIBBEAN STATES ? The announcement, made by UK Foreign Secretary Boris Johnson, that High Commisioners will thereafter be appointed and posted to Antigua & Barbuda, Grenada, and St Vincent & the Grenadines, is a rare bit of welcome news, as many of the East Caribbean States, and Antigua and Grenada in particular, have wallowed in what can only be refered to as systemic corruption, and the presence of British diplomats may cause local government officials to reduce their amoral, and indeed illegal, conduct. Some of the leaders of the East Caribbean states are running their countries as if they are personal piggy banks for their corrupt benefit. In Antigua, of a reported $200m earned in the country's Citizenship by Investment (CBI) economic passport program, only a minimal $20m has been said to have made it into the country's National Treasury. In Dominica, there have been at least 500 illegal diplomatic passports issued, in a program that is totally in violation of the United Nations Vienna Convention requirements. In virtually all the East Caribbean states, voter fraud, meaning the open purchase of votes during national elections, including flying in expats and students studying abroad, to cast their votes for the parrty in power, is a normal occurrence, during a long, 20-year history of corruption. 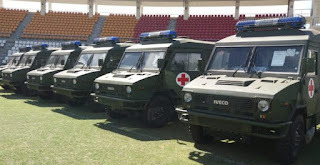 Ususping the Rule of Law, in the local couert systems, using the local police to openly intimidate Opposition parties and leaders, and seeking to destroy the reputation of any individuals who seek reform, all add up to an untenable situation, in which democracies become little more than banana republic dictatorships. Let us hope that this return to a UK presence will serve to check some of the more outrageous corruption, and indeed give birth to effective reform movements in the East Caribbean. Leroy King, the former head of Antigua's Financial Service Regulatory Commission, and a six-year fugitive from American justice in the Allen Stanford billion dollar Ponzi scheme Federal criminal case, is reportedly contemplating cooperation with the US Attorney's Office, in order to obtain a favorable plea agreement. 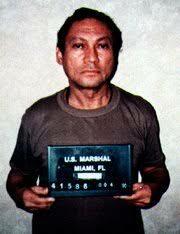 Should King be ultimately extradited, and tried, he could end up with what amounts to a life sentence in Federal Prison. Therefore, his reasons for cooperating are understandable. Should Mr. King provide Substantial Assistance to the United States, there could be additional indicmtents in the Stanford case. Antiguans believe that he would implicate a former Prime Minister, the current Prime Minister, other ministers, and two prominent East Caribbean attorneys, for their alleged role in Stanford's massive Ponzi scheme, involving the now-closed Stanford International Bank, whose headqurters was in Antigua. The former regulator has openly discussed the possibility of his cooperation with associates and friends, but there is no information currently available regarding whether he has, or has not, formalized any plea negotiations. 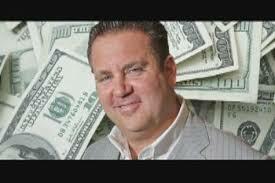 A US District Judge in Florida has granted the motion, filed by the US Attorney, to withdraw the Rule 35(b) motion to Reduce Sentence that his office filed on behalf of the attorney/Ponzi schemer Scott Rothstein. The defendant's attorney, and later the defendant himself Pro Se, opposed the motion, and filed memoranda of law, contesting the Government's right to withdraw its motion. Rothstein perjured himself, wheh he sought, unsucessfully to assist his wife in concealing and selling their valuable jewelry collection, a clear violation of his obligations under his Plea Agreement. The Court, in a 9-page opinion, with extensive citations to authorities, held that existing case law interpreting the provisions of the Rule 35 motion, favored the Government's position. The ruling was no surprise, given that the preponderance of decisions supports the Government's sole discretion expressed in the motion. Scott Rothstein, whose 50-year sentence for running a bogus investment scheme, claiming to sell out-of-court settlements for sexual harrassment and employee discrimination claims, must now serve 42.5 years for his crimes. WHO DID MINISTER FERNANDEZ DISTRIBUTE THE $15M TO IN ANTIGUA ? When then-Foreign Minister Charles Fernandez received the fifteen million dollar upfront payment from Chinese billionaire (and then-fugitive from justice in China) Xiao Jianhua, where did all that money go ? It apparently was never properly accounted for, and it was never deposited in the official treasury, according to CBI program guidelines. The expanding scandal has increased the Antiguan public's perception about systemic corruption, at the ministerial level, and could topple the present government, unless true reforms are implemented, due to malfeasance in office. Remember well the case of former Prime Minister Patrick John of Dominica, where mass protest caused his resignation. The money was prepayment for a total of two hundred A & B CBI passports, but the passports were never delivered, and later disappeared under circumstances that lend themselves to the presumption of official corruption. A page thought to have been taken from one of the passports was found in the possession of a senior St Vincent police officer, when he was himself arrested by the SVG Drug Squad, which led to the subsequent dismissal of an Antigua Police Inspector, and the targeting of two diplomatic professionals, as suspects in a major passport fraud scheme, being conducted in SVG, with assistance from greedy and amoral Antiguans. So who else was the fifteen million distributed to ? 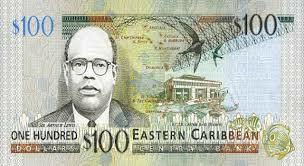 Reliable sources in Antigua assert that certain senior government officials in Antigua received portions of this money, as did the participants in the scheme to create counterfeit passports abroad, all of whom were in the same criminal conspiracy. Their identities are known, and if any of them were foolish enough to deposit those criminal proceeds into a financial institution, or move it into the United States, and/or spend any of it there, a 20-year sentence for money laundering could be in their future, and their "diplomatic status" will not save them; look at the late lamented President Manuel Noriega. He served that sentence, and later died a prisoner in the Republic of Panama. A powerful South Korean-based organized crime syndicate has large quantities of the most dangerous version of the North Korean-made USD$100 "Supernote," the counterfeit one hundred dollar bill. Should it be released, in bulk, into the global economy, it could wreak havoc with international trust in American currency, and possibly even economic damage. The bills, which were made on or about 2006, and reportedly stored since then in the Peoples' Republic of China, and later smuggled into the Republic of Korea, have been withheld from circulation, but one example was found in a bank in Seoul, in late 2017. 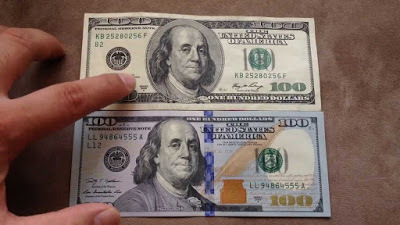 It took a team of experts at KEB Hana Bank to ultimately conclude that it was a counterfeit, which is testimony to the accuracy of the counterfeits. One South Korean source claims that the plates for the Supernote were made in the ROK, and smuggled north, but there has been no independent confirmation of this to date. The Series 2006 was the last issue of the US one hundred dollar bill made prior to the insertion of a number of advanced anti-counterfeiting features, though examples of counterfeits from the later era have also been seen, and photographed, in South Korea. The powerful organized crime sydicate, which has reportedly long had ties to the South Korean military, allegedly used the counterfeits as collateral for large bank loans, by claiming that the money was genuine. It holds these counterfeits in a number of guarded warehouses, some in locations that corroborate the claims of military protection of the syndicate. Previous links to the country's intelligence community have also been verified. 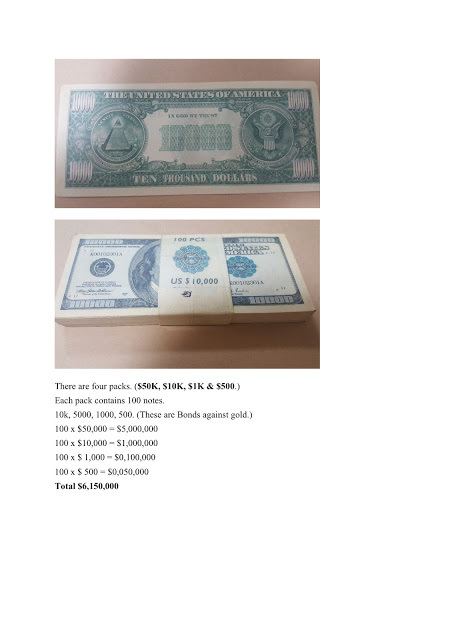 The organized crime group also holds large quantities of counterfeit currency of a number of Asian countries, but whether these bills were printed in North Korea has never been verified, though they are also suspected to be of DPRK origin. There are, literally, pallets of these bills, in secure storage. The syndicate also holds quantities of bogus bonds, also purportedly of US Government origin, but which must be forgeries, due to the fact that such financial instruments, in those specific amounts, were never issued. It also, strangely enough, holds US currency which was never printed, such as a well-made $10,000 bill, ostensibly printed in 2006, using the image of Benjamin Franklin, or a million dollar bill, using the George Washington inage. While no Western banker would ever accept such financial oddities, they could possibly be used for fraud, as potential bogus collateral oveseas, or in private criminal transactions, especially involving the storage of wealth* obtained in narcotics transactions. Also, remote areas, where American financial instruments are rarely seen, and unfamiliar to businessmen there, might be a ripe area for massive fraud. A five hundred dollar bond, with the image of Ulysses S Grant thereon, and attached interest coupons, could result in a hige payday for the seller, even if heavily discounted. What is not known is whether the South Korean organized crime syndicate has any direct connections to the DPRK government, other than as a buyer of counterfeit instruments. That is a matter for further investigation. The clear and present danger that the Supernote poses to the United States cannot be underestimated. Givewn that there has been no US Treasury alert posted, either publicly, or to the financial community at largemay indicate that details of this threat are either discounted, or that the information has been classified, due to concerns that it might damage the image of the US Dollar overseas, and also its value on international markets. Whatever the reason for a virtual US news blackout on the subject, the latest iteration of the $100 Supernote deserves attention, before some Korean mob boss decides to open the doors of one of those warehouses, and starts offering them in bulk, as was recently seen in Singapore, at 50 cents on a dollar of face value. Once the genie is out of the bottle, it will be imposible to put him back. * Selling bogus high-value instruments to criminals is not a stretch, though inherently dangerous. There are nearly one million Canadian $1000 bills still in circulation, most of whom are believed to be held by criminal organizations there We note that Canada is seeking to pass legialation to declare its $1000 and $500 notes as no loner leal tender. Most of the €500 notes in the EU are in the hands of organized crime, largely in Spain. DID ASOT MICHAEL TAKE STOLEN PASSPORTS TO LONDON ? As more information becomes known, regarding the Antigua stolen passport scandal, one recent episode starts to finally make sense. When former Minister of Tourism, Economic Development, Investment & Energy, MP Asot Michael was detained & interrogated by British law enforcement, upon arrival in London, he was abruptly and immediately relieved of his ministerial portfolios. Why did that happen ? He was not charged with a crime. Though there were accounts that he had Antigua passports in his possession when detained, they were curiously not on the inventory. Antigua spokesmen said he had no access to passports, so therefore, he could not possibly have any. 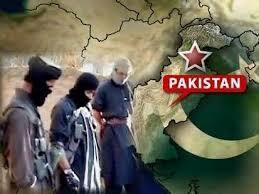 Other sources, however, stated that he did, indeed have several passports on his person. 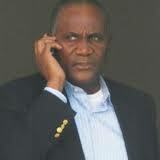 Here's a clue ; MP Michael is a cousin of one of the Antigua diplomat players in the 200 stolen passport scandal. We believe that some of those blank passports could easily have ended up in his hands, and had their existance in his bags been revealed , the cover-up would have been exposed. No wonder he was quickly, but quietly, cashiered, while retaining his seat in the Parliament of Antigua. This brings up our pending question of the week: who in Antigua government knew about the stolen passports and when did they know it ? 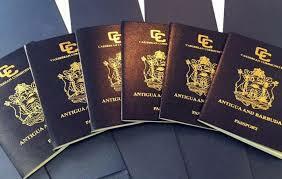 A prominent member of the Antigua diplomatic corps has been identified, by reliable sources, as one of the three local partners in an international scheme to sell counterfeit passports to foreign nationals, using authentic pages extracted from stolen blank passports. This individual, whom we choose not to name until his arrest or indictment, has served Antigua in a number of international diplomatic postings and missions. It is believed that he used his position, and family relationships, to facilitate the illegal diversion of the missing two hundred blank passports, and shared in the criminal profits. What is most disturbing about this individual is that he is also known to be receiving unlawful compensation from an international consultancy that services Antigua's Citizenship by Investment (CBI) program, which is a clear conflict of interest, and a violation of the laws concerning corrupt acts. His connections with senior government officials are believed to have given him virtual immunity from criminal prosecution, but his most recent scandal, involving the arrest of his counterfeit passport scheme co-conspirators in Saint Vincent, may strip away the official protection that he has enjoyed to date. 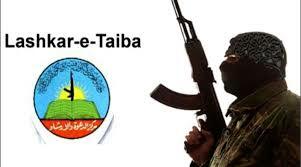 His biography does not show any professional or educational preparation for diplomatic service. 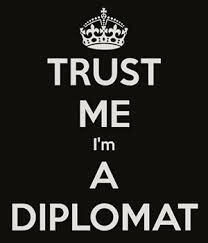 The Antiguan public's strong reaction to the counterfeit passport scandal could signal a genuine need for comprehensive government reform in Antigua & Barbuda in the Ministry of Foreign Affairs, to include actual professional and educational requirements for serving diplomats, disqualification of applicants with close family relationships in government, and ethics and corruption continuing education. Finally, the issuance of diplomatic passports, to anyone willing to pay cash for them, should be discontinued, lest the United Nations Office of Legal Affairs agrees to take action. WHAT DID THE ANTIGUA GOVERNMENT KNOW AND WHEN DID IT KNOW IT ? We are concerned that the fact that two hundred blank Antigua passports that were assigned to a Chinese billionaire, to vend in Hong Kong. and never delivered to their owners, allthough they were thereafter to be delivered to individual Chinese recipients, ended up in the hands of criminal elements. If the SVG Drug Squad had not arrested two suspects, and seized all the necessary components they had to create bogus Antigua passports for illegal global use, the truth might never have been known. So the question must be asked: how long did the Government of Antigua know that the passport pages were being sold, and when did it know that ? Obviously, the two hundred passports were in the custody and control of the Ministry of Foreign Affairs, but never released to Xiao's clients, and then mysteriously stolen; two individuals that are, or were, part of that ministry are the other local suspects in the Antigua-based passport smuggling scheme, whereby the genuine personal history pages were removed, and sent to the Saint Vincent-based passport sales gang. Given that the 200 passports were never delivered to Xiao's clients, did the then-Minister of Foreign Affairs notify senior government oficials of this fact ? It is reasonable to suspect that notification was made, especially after Xiao diaappeared from Hong Kong under suspicious circumstnces that led most to believe that he was kidnapped by agents of the Peoples' Republic of China for alleged financial crimes. Who released those passports ? What about the so-called "Inventory Control" that was purportedly in force in Antigua ? How did those passports end up in the hands of a controversial Police Inspector ? The Ministry of Foreign Affairs has a lot of explaining to do, the public in Antigua deserves to know what senior government officials know about the 200 passports, and when did they know it. Sources inside Antigua have advised that the Royal Police have, in the course of this week's search and seizure raids, all of which are seeking evidence from the local members of an international gang making couterfeit Antigua passports, have seized cash totalling approximately USD$115,000. 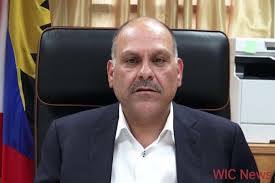 It is not known precisely where the seizure of cash ocurred; one reliable source stated that it was at a residence of a paramour of Police Inspector Ray John. It was John's own residence that was the first focus of the police seasrches. There is apparently an expanded operation, being conducted by the Royal Antigua & Barbuda Police Force, to locate the the missing two hundred (200) blank Antiguan passports, which were supposed to have been entrusted to a Chinese diplomatic passport holder, but which now appear to have been taken by two individuals from the foreign affairs sector of government, and sold to criminal elements, with the alleged assistance of Inspector John. The Government of Antigua, in a press release, appeared to try to minimize the number of Antiguan passport pages seized by the authorities in St Vincent, when the Drug Squad arrested two individuals. in possession of special printers, memory sticks, and other incriminating items, all of which indicate that the detainees are engaged in a majior Antiguan passport coiunterfeiting scheme, but thousands of bogus passports were allegedly manufactured and sold to foreign nationals throughout the globe. 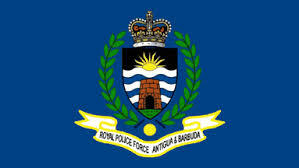 The Royal Police Force of Antigua & Barbuda, serving a search warrant at the residence of prominent Police Inspector Ray John, removed two large evidence bags from the premises, in a case said to be closely related to the recent arrest of two passport fraudsters in St Vincent. 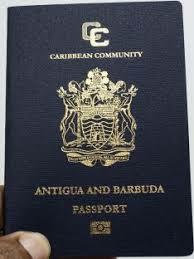 Those arrested in St Vincent had, in their possession, legitimate personal identification pages from Antiguan passports. The were part of a ring known to have illegally sold bogus Antigua passports to foreign purchasers, using generic blanks purchased from an identity document factory located in Europe, to craft credible counterfeits. 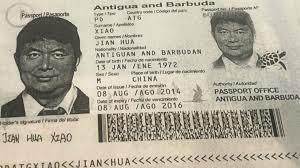 Antigua insiders assert that the missing two hundred blank Antigua & Barbuda passports, scheduled to be given to the missing Chinese billionaire Xiao Jianhua, holder of an Antigua diplomatic passport, were never delivered, and three conspirators, including Inspector John, and two other individuals connected to the Foreign Ministry, obtained them and sold them to the passport fraudsters. That is why the pages seized in St Vincent are genuine, and not counterfeit. Nobody is in custody in Antigua at this time, but arrests are believed to be imminent. There are serious concerns expressed recently about applicants for CBI programs who proffer legitimate proof of identity, including passports, birth certificates, and drivers' licenses, using aliases, thereby denying that any effective investigation will occur, since the true legal name of the applicant is never disclosed. The documents, which are generally obtained through bribes, from cooperating individuals at official government agencies, are real. Additionally, as we have again seen this week, in the case involving the arrest of individuals who allegedly have created counterfeit Antigua & Barbuda passports for clients, there are forms of identity in circulation, which appear to be completely legitimate, bearing aliases of the holders. 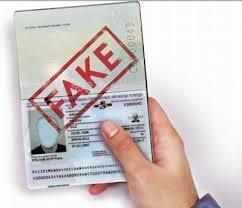 How can the true identity of the holders of these bogus passports be ascertained ? First, it is well-established that the traditional due diligence investigations are now obsolete, and it cannot solve the two problems mentioned above. 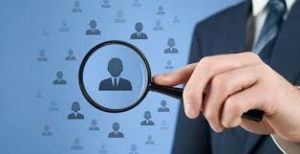 Furthermore, any Enhanced Due Diligence program, to be completely effective, must contain a Facial Recognition Software component, capable of identifying or verifying an individual, from the images he or she presents. These programs compare the applicant's images to a database of digital images and video frames from video sources. 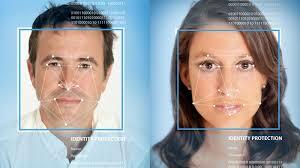 When you have career criminals, corrupt Politically Exposed Persons (PEPs), international sanctions evaders, and even individuals named by OFAC, seeking CBI passports, it is necessary that effective Facial Recognition Software be an integral component of the vetting process. Additionally, it is advisable that a look-back be performed in all existing CBI passports holders, to identify those who managed to gain a passport using documents that do not contain their legal names. For some reason, none of the articles covering the recent revocation of the CBI passports of six individuals have mentioned that all of them are Iranian nationals. The grounds for the abrupt cancellation of the passports have not been made public, other than a vague statement that they "have committed acts which may bring St Lucia into disrepute." It could be participation in Iran's international sanctions evasion schemes, espionage, terrorist financing, or criminal conduct; we do not know their offenses. Most CBI insiders know that the vast majority of St Lucia CBI passport holders are Iranians, and it has been estimated that they constitute more than 90% of all the country's issued and outstanding CBI passports are held by Iranians. Given existing international, US & EU sanctions, and the potential for armed conflict in the Middle East, involving Iran, St Lucia's government must be seriously lacking the ability to foresee the probable unintended consequences of their giving passports to members of a regime whose nationals are carrying out foreign policy goals contrary to Western values, laws and ethics. Do they know how to spell Enemy Aliens ? Two suspects were arrested recently in St Vincent by the Drug Squad; they were found to be in possession of a special printer, memory sticks, and personal information pages from a number of what appeared to be biometric passports from Antigua & Barbuda. The pages, which identify individuals from Australia, Dubai UAE, and Egypt as Antiguans, are evidence of a massive passport fraud scheme that offered bogus A & B passports to foreign nationals. Extradition to Antigua is expected to occur shortly. A confederate, operating out of Antigua, allegedly assisted with the acquisition of the format of biographical pages, which were then created and inserted into passport blanks in St Vincent. His identity is reportedly known. One source stated that thousands of passports have already been created and delivered, using sophistocated techniques. It is not known where the bulk blank passports were manufactured, but a company in Europe, already under law enforcement investigation, may have been the source. Did the gang manufacture counterfeit passports from other jurisdictions ? There is insufficient information available from the initial arrest reports, but the generic passports they had acquired could be used to create authentic-looking documents for most countries. Chinese military vehicles, delivered to Dominica this week. 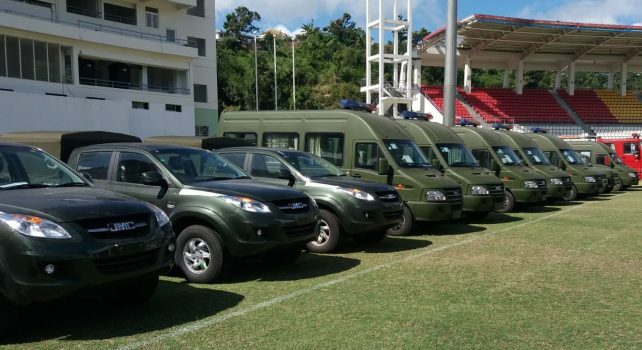 This week, armored cars and other military vehicles arrived in the Commonwealth of Dominica, courtesy of a multi-million dollar grant from the People's Republic of China, which previously has supplied arms & ammunition, and even camouflage uniforms and equipment, to the country's Special Services Unit, its paramilitary police. For a nation with no external or domestic national security threats, Dominica is becoming an armed camp, with military capabilities that far exceed its law enforcement needs. 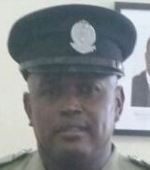 Last year, the country's Minister of National Security, Rayburn Blackmoore, ordered the Chief of Police to ascertain which members of the force were "for or against the government," to weed out any officers whose political leanings were not in favor of the ruling Dominica Labour Party, and the present Prime Minister, Roosevelt Skerrit. The increase in the number of sworn law enforcement officers, past the point where an objective observer would consider their numbers clearly excessive, the only conclusion one can draw is that it is being augmented to be able to physically suppress any possible organized protests, on the part of the Opposition, during the next national election, which will feature massive election fraud, as has happened for the past fifteen years. The influence of the Peoples' Republic of China should not be underestimated; China's massive embassy, which is believed to be monitoring United States military activity in the Caribbean, and conducting electronic surveillance of communications in the region, as well as a base for intelligence officers in the field, is furthering China's global ambitions in the Caribbean, which the US generally ignores, and takes for granted as allies. Remember, the Prime Minister of Dominica is a hardline Socialist, whose mentor was Hugo Chavez, and who identifies with the regime in Cuba. He is no friend of the Wesrtern democracies. 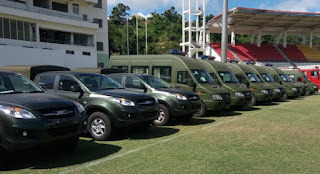 Additional Chinese miliotary vehicles, now delivered to Dominica. A final note, and a disturbing one, when China evacuated its embassy staff from Dominica, in the aftermath of Hurricane Maria, in 2017, 462 Chinese nationals were removed from the country. Since China has neither any trade, nor tourism, with Dominica, what are all those Chinese nationals doing in the embassy ? Where is Dominica heading ? As the liquidation of two insolvent Cayman companies owned and controlled by a fugitive, the Canadian fraudster Ryan Bateman, proceeds, government officials are alleging that no victims have ever come forward, to make a formal claim of loss. This information is totally false, and efforts to circulate this blatant lie, calculated to cover-up one more major financial scandal in a long line of cases where foreign investors lose everything, and Cayman residents who are guilty are never charged with criminal conduct. 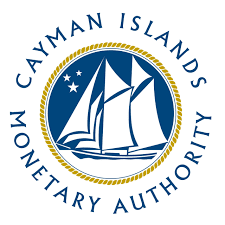 Our previous coverage of the case, where the fraudsters were named the "Cayman Gang of Four" by the media, detailed what the Cayman Islands Monetary Authority (CIMA) estimated was a $400m loss, sustained by approximately sixty Canadian retirees and pensioners, which was stolen by Bateman and the other gang members, Sharon Lexa Lamb, Derek Buntain, and Fernando Moto Mendez. 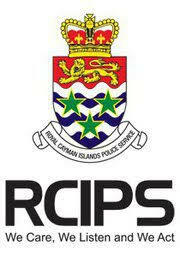 None of the fraudsters was ever brought up on charges in the Cayman Islands. It was the thirteenth reported major fraud in the Cayman Islands, involving foreign investors who sustained a total loss, due to fraud and theft on the part of Cayman Islands residents, where zero dollars were recovered for the victims. Now, government is claiming that NO investors ever filed a claim with CIMA or the RCIPS. I personally know of filings with both agencies, and still maintain copies in my files. The untrue allegations were meant to bury a major scandal, so that future prospects are not deterred from participating in the next Cayman-based investment sheme. 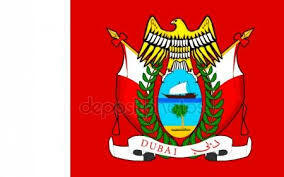 For those who believe that all the Dubai-based immigration attorneys who specialize in assisting clients in obtaining Citizenship by Investment (CBI) passports are benevolent legal advisers, allow me to interject.There are a number of such lawyers who, in addition to handling legitimate CBI matters for clients, are engaged in illegal global Iran sanctions evasion operations, on a massive scale, using their legal practices in neutral Dubai, to conceal their dark deeds. If you were wondering how this information came to surface at this time, look closely at the latest Iran sanctions evasion case to be filed in New York District Court against Ali Sadr Hashemi Nejad, of Malta's Pilatus Bank, and at the Reza Zarrab case, also pending in New York. 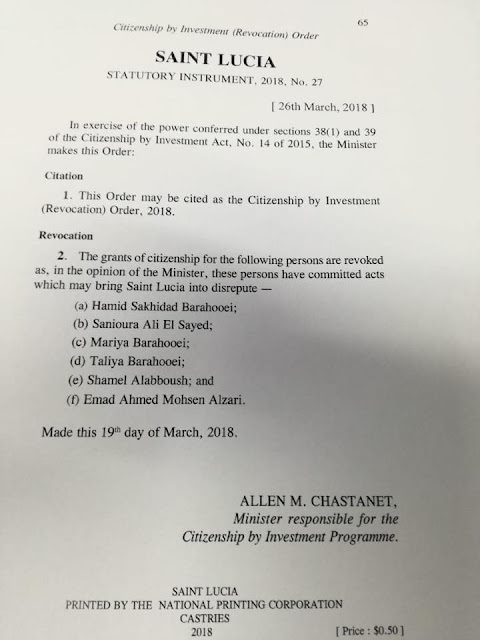 These individuals possessed CBI passports, and both were advised by Dubai-based attorneys, none of who has been publicly named, or charged, at this time, though they may be the subject of sealed indictments. The lawyers' identities, due to their overlapping associations with clients across the spectrum of illicit Iran sanctions evasion operations, have become known to us. There are several Iranians fully engaged in Iran sanctions evasion activities; evidence of that is the Death Row inmate, Babak Zanjani, and his partner Alireza Monfared, also somewhere in custody in Iran. Note that several of their partners have approached the Government of Iran, with the goal of paying off Zanjani's missing billions, to have his execution cancelled. Those individuals are still active, regretfully, and continue to operate their sanctions evasion criminal enterprises. Reliable reports from the Middle East advise that there are seven, independently run, sanctions evasion programs, which are supervised and managed by their Dubai lawyers, in a continuing criminal enterprise. While those attorneys are known for their CBI and passport practices, their covert activities continue unabated, due to the curious "hands-off' policies the UAE states observe, regarding their large Iranian expat population, and violations of international sanctions. Will the guilty lawyers be exposed (and indicted), and their sordid acts ever see the light of day ? We cannot say, especially since they do not seem to be entering the United States of late, where they could be detained, and indictments unsealed. Should they be named ? Rather than reform their programs, the majority of the five CBI East Caribbean States continue to improperly vet applicants from high-risk jurisdictions, and jurisdictions known to be State Sponsors of Terrorism. One new CBI construction project appears to have totally disregarded risk issues, and plans to sell its residential units, which come complete with a CBI passport offering visa-free entry to over 135 countries. 1. A lack of available English language comprehensive data on Iranians. A lack of useful open-source databases on Iranian nationals and expats. 2. The risk that names, places of birth, and date of birth may have been altered on identity documents presented to CBI unit staff, or clever, and authentic, aliases provided on official documents. 3. The risk that applicants may be Politically Exposed Persons (PEPs), who have access to government funds and accounts, and who could be using the Proceeds of Corruption to make their CBI purchase. 4. The lack of any database that could be used to run Facial Recognition software against the images of the Iranian applicants, to confirm identity. 5. The difficulty in correctly transliterating Persian (Farsi) names into English equivalents that will be properly formatted to check against sanctions lists, and databases of high-risk individuals. 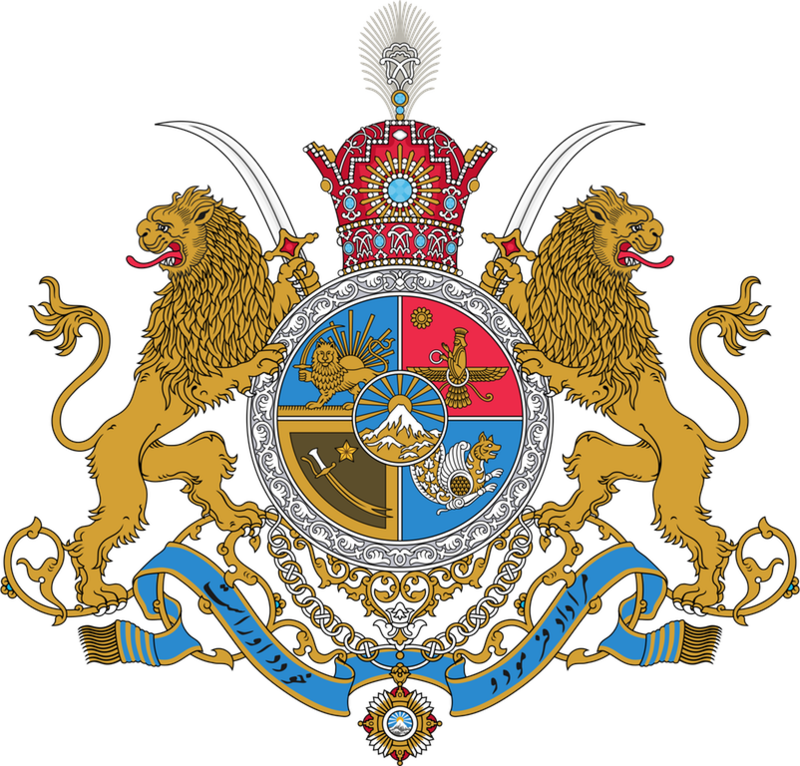 Marketing to Iranians, knowing the difficulties involved, will result in up to one hundred and eighty unknown Iranian nationals, that are not properly screened and cleared by Due Diligence, obtaining completely new, and clean identities, with which to visit the Commonwealth, the EU Schengen Zone, and other visa-free jurisdictions. The potential for the facilitation of money laundering, terrorist financing, moving the proceeds of corruption, and espionage, by Iranians using these passports, is huge. The legal, political and diplomatic consequences of this project cannot be predicted, especially whether it will result in blacklisting of the entire country, or all its passports by North American or European immigration officers, or their banks. Is the proverbial straw that will break the CBI camel's back, with blunt American pushback, by the banks or the government ? We cannot say, but the arrogance of those who conceived of this project may result in painful pushback. A Federal corrections official, Victor Casado, was charged with multiple counts, involving delivering contraband to Iran sanctions evader, Reza Zarrab, while he was incarcerated. Zarrab received contraband while in prison, inclding alcohol concealed in water botles, cellular telephones, food and non-prescription drugs, for which it is alleged Casado was paid $45,000 . (2) Providing Contraband in prison. (3) Conspiracy to Commit Honest Services Fraud. A number of unidentified co-conspirators appear in the Complaint, including an attorney, and the attorney's driver. Considering the reputation of Zarrab's eminent criminal defense counsel, it is impossible that any of them would stoop to bribing a jailer to send contraband to a client in prison and they have denied any role in the crimes, nor even knowing about it. One report, however, asserts that a "Turkish lawyer" who was assisting Zarrab in prison was involved in the corruption. This means that a foreign attorney, not admited to practice in Federal Court, and not part of the defense team, made the illicit payments. Unfortunately, the Complaint does not further identify him. It is not known whether Reza Zarrab implicated Victor Casado, or any of the other uncharged co-conspirators. For readers who require more details, the case number is 18-02826-UA (SDNY). 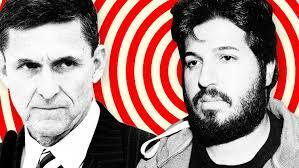 Zarrab is believed to be the Office of Special Counsel's major witness against former National Security Adviser Michael Flynn.